Jaguar grabbed the limelight on press day at the Paris Auto Show 2010 by pulling the wraps off its high performance C-X75 concept car. The brand celebrated its 75th anniversary with the launch of the concept car which marked a new trajectory of high-performance Jaguars with minimal or zero emission. The C-X75 is a perfect example of the old-school super-car in terms of its performance, but it is completely contemporary when it comes to maneuvering. Each wheel is equipped with a 145 kW (195 bhp) electric motor for propulsion, alongside a centrally vaulted battery pack. 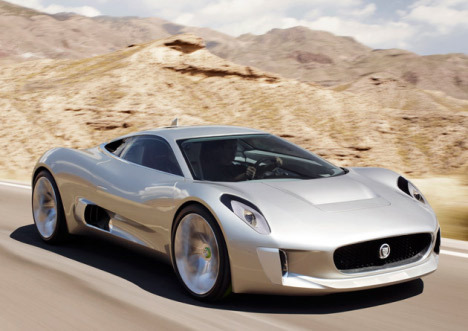 Inspired by Jaguar’s XJ220, the C-X75 runs on electric motors that work in sync with a pair of micro gas-turbines producing a torque of 1600 NM and a power of 780bhp. These turbines compress air to run a generator that produces electrical current recharging the lithium-ion battery pack. The car takes 6 hours for complete charging and traverses a distance of 68 miles when fully charged. The C-X75 produces an acceleration of 0-62mph in 3.4 seconds and reads a top speed of 250 mph that is 330 km/hr. With the gas turbines running in the C-X75, CO2 emission only shows 28g/km. The embedded four-wheel-drive system provides outstanding grip for the high-performance car. The car flaunts a plush and luxurious interior made of leather, neoprene and soft-touch materials. The seats are vaulted over the bulkhead resembling a single-seat racing car. The Managing Director of Jaguar Cars, Mike O’Driscoll stated that the C-X75 is an engineering marvel designed as a tribute to all the Jaguar patrons across the globe! I’ll have to go back and read all your previous posts now. @badmash – any topic suggestions?